Communities affected by oil palm plantations organized a Forum in the city of Yurimaguas to denounce and expose the social and environmental impacts of these plantations. Companies have diverted and drained streams to the point where many communities no longer have water. Families still living in and around plantations also feel that imminent expansion of this monoculture threatens their ability to remain in the territory. The fact is that large-scale oil palm plantations are no longer limited to Southeast Asia, although Indonesia and Malaysia still produce 80% of this oil worldwide. In addition to expanding in several African countries, the total area planted with oil palm in Latin America has doubled since 2001. According to a study that analyzed the types of land converted for palm cultivation in ten Latin American countries, Peru showed the highest rate of deforestation for industrial oil palm production. This is particularly worrying in the Loreto region, where 85 per cernt of the palm plantations have been established in areas where there was previously tropical rainforest. (1) These facts, along with the many complaints that peoples and communities affected by this industry have made, make industrial oil palm plantations an emerging threat to the Peruvian Amazon. In the 1990s, neoliberal adjustments marked the end of support mechanisms for small-scale agriculture (subsidies, credits, buying of production, etc. ), and the settlers — most of whom had been encouraged by the State to expand the agricultural frontier in the Amazon — were left behind. New invasions began in the 2000s: the construction of two mega-highways (the Interoceanic North and South highways), the accelerated growth in the exploration and extraction of petrol and natural gas, the implementation of the timber extraction concession system, the boom in river gold mining, and industrial oil palm plantations. Even though Peru is not a major player in the global palm oil market, according to some statistics, it is the country where this crop is expanding the fastest. In the context of promoting agricultural expansion, the Peruvian government fostered a series of regulatory reforms to encourage oil palm cultivation. Among these reforms, the May 2000 Supreme Decree N° 015-2000-AG stands out. This decree states that it is in the ‘national interest’ to set up oil palm plantations in areas that have a capacity for greater productivity, in order to — among other things — contribute to the restoration of land deforested by shifting agriculture and the proliferation of illicit activities (3). The State classifies land according to two kinds of soil in the rainforest: forest capacity and agricultural capacity. On forest-capacity soils, neither crops nor livestock are allowed. Any activity of this kind is illegal. Oil palm plantations should have been planted in deforested areas (with agricultural-capacity soils); however, the vast majority have been planted where there was rainforest (with forest-capacity soils). Companies illegally obtained permits in forest areas for agroindustrial purposes. In some of these areas, peasants had set up small settlements, including agricultureplots. Even indigenous territories were affected. The Palmas Group (part of the Romero group, the second most important economic group in Peru) is one of the oil palm pioneers in the country and is currently the largest producer. This group has developed two large industrial plantations: Palmawasi in Tocache, and Palmas del Shanusi on the border between Loreto and San Martín. Then there is the Melka Group, belonging to Czech-American citizen Dennis Melka, an investor affiliated with industrial oil palm plantations in Malaysia. This group has two large plantations in Ucayali, which together cover about 11,000 hectares. In 2006, government agencies, consultants and company representatives promoted the arrival of Romero Group (now called Palmas Group) to Loreto and San Martín as an important development alternative for communities. However, over ten years later, it is clear that this “development” meant destruction and conflicts for these communities. Unlawfully, the Palmas Group obtained land to set up their oil palm plantations in primary forests, swamps, wetlands and areas with freshwater springs. In 2006, the Ministry of Agriculture granted over 7,000 hectares of primary forest to the Shanusi company — today Palmas de Shanusi S.A. — at a price equivalent to almost 18 nuevos soles per hectare (about US $5). The Empresa Agrícola de Caynarachi — today Palmas del Oriente S.A. — received 3,000 hectares in 2007, at a price equivalent to 150 nuevos soles per hectare (around US $45). Both companies belong to the Palmas Group. “The company [Palmas del Shanusi of Romero Group] entered the community in 2005 and made trails so that they could set up their camps and cut down our forests. In 2006 they put in machines so that they could deforest, straighten our streams and plant oil palm. There were wetlands and many swamps on that land that gave life to the streams,” says Jovina of the Friends of the Forest Producers Association, from the community of Cotoyacu. Faced with this situation, 14 communities affected by the oil palm plantations of Palmas del Shanusi S.A and Palmas del Oriente S.A. organized a Forum in the city of Yurimaguas in June 2018, in order to expose the impacts in areas next to the Huallaga, Shanusi and Cainarachi Valleys, in the San Martín and Loreto regions (5). 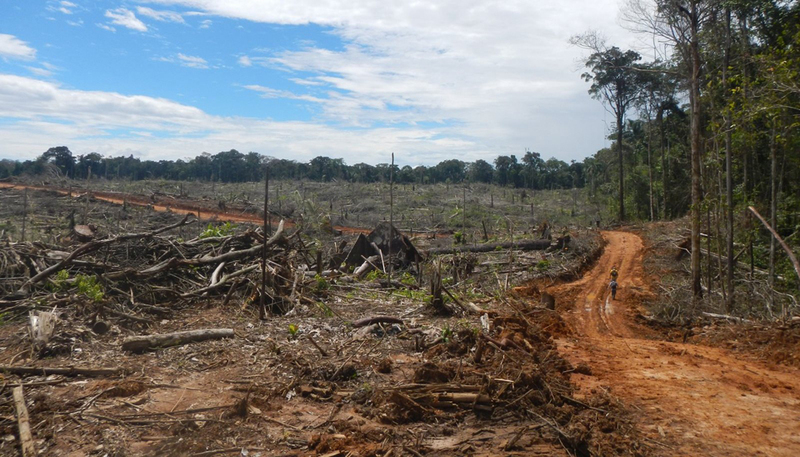 At the Forum, participants claimed that instead of requesting degraded land — as mandated by law — companies have profited from the land and timber extracted from primary forests. Their operations have diverted and drained streams, to the point where many communities no longer have water. Water sources have disappeared, as have hundreds of hectares of swamps. Stream water that communities used for their basic needs has been contaminated, causing fish to disappear as well. Forum participants also reported that the results of laboratory tests carried out by state institutions to determine water quality had been manipulated, as these results indicated there was no contamination. Yet testimonies about animals that died from drinking the water, and fish that disappeared, confirm a different reality. Participants also noted how oil palm plantations are sprayed using aerial application of pesticides, whose components are not only harmful to water sources, but to human health, wild flora and fauna and subsistence farming areas. Forum participants stated that the purchase of land has been mostly fraudulent. They claim that a lot of pressure and violence was used in some cases, by way of frontmen and armed vigilante groups. Consequently, there are now communities in which a large part of the population has no land. They also exposed how companies are preventing people from accessing their own land, by putting gates on public roads. They revealed that some peasants are being unjustly prosecuted for crimes against forests and growing stocks, for having allegedly logged without proper permits — when in fact, it is the companies that are deforesting and illegally benefiting from the land and timber. Communities that live in and around industrial oil palm plantations are still living in tense situations, because Palmas Group companies want to expand their operations even more. And according to community members, they are already looking for ways to take away their land. In the face of this threat, it is only through organization and unity that peasants will be able to challenge the onslaught of industrial oil palm plantations onto their territories. The case of Cotoyacu provides an example of this. “In 2015, after having endured ten years of contamination and deforestation, we met to see what we can do; and we decided to organize as a community,” recalls Jovina. The support of the Pastoral de la Tierra team was fundamental in this process; because in a context where the company flaunts its power, communities feel alone, isolated and end up giving up. By knowing their rights, tirelessly monitoring their territory to avoid the company’s impacts, and filing complaints before various state institutions — complaints which have also been broadcast in the media, they have prevented the company from continuing to deforest and plant on lands bordering their streams.